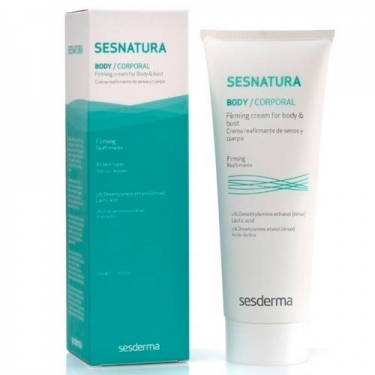 DESCRIPTION: Sesnatura Firming Cream Body and Bust from Sesderma is a firming cream that prevents and treats sagging skin. Immediate firming effect. This firming care results from the combination of active ingredients: dimethylamino ethanol, collagen, hydrolyzed elastin, matrixyl, lactic acid and soy extract for a moisturizing, immediate firming, regenerating, anti-aging and anti-staining action for firmer, smoother skin and revitalized. Treats flaccidity caused by weight loss, pregnancy, breastfeeding or excessive exposure to the sun, preventing premature skin aging. Suitable for breasts and body. Apply 2 times a day on the skin of the sinuses and affected areas, with a gentle massage until completely absorbed.